You know how much I love making (and eating!) homemade marshmallows. So would you be surprised to learn that I don’t like those famous marshmallow Peeps? I don’t think I’ve ever eaten a whole one, not even as a kid. I tried really hard to like them when I was young, I really did. 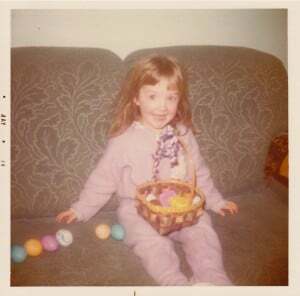 But I always ended up trading them off for somebody else’s Easter basket confections. Probably for some chocolate marshmallow bunnies. Much more my style. Can you see the yellow Peeps in my basket?! So, in an attempt to make up for lost time…I’ve come up with a way that guarantees my own indulging in some yellow chicks this spring. Homemade Marshmallow Chicks. Aren’t they adorable?! I dipped them in white chocolate, tinted a springy yellow. Then, per Tessa’s request for some feathers, I sprinkled them with a bit of yellow sugar. Adding some little blue eyes and glossy orange feet, we birthed a whole flock of sweet little chicks. Now these are my kind of Peeps! 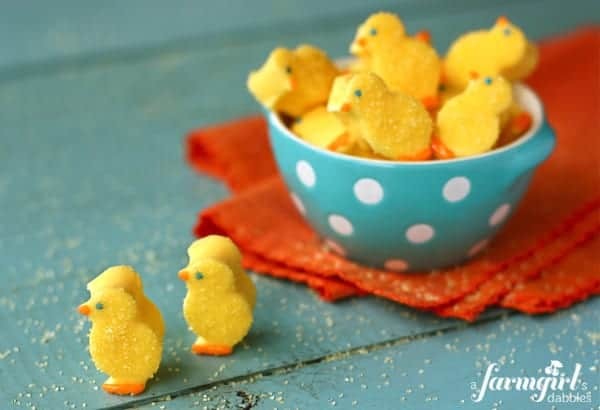 Dip your small chick-shaped cookie cutter (mine measures 1″ wide by 1-1/2″ tall) into a shallow bowl of water and then cut the slab of marshmallow into chick shapes. This is a sticky job, but just have patience. It’s worth it! It helps to dip the chick cutter into the water in between cuts. Repeat this process until the whole slab of marshmallow is cut. Using the microwave, carefully melt the white chocolate in a glass, taking special care to not let the white chocolate get too hot. It’s best to partially melt the white chocolate and then just stir it until completely melted, then color with candy coloring to your liking. Drop a marshmallow chick into the colored white chocolate and dunk with a fork to completely coat. Pick the marshmallow up with the fork, allowing excess white chocolate to drip off while lightly tapping the fork to coax more of the excess off. Then slide the fork out of the glass, scraping the underside of the tongs along the rim of the glass. This will scrape off any remaining excess white chocolate, so you don’t have a pool of it form around your chick as it cools. Set the white chocolate coated chick on parchment paper. Then, while the coating is still wet, place a blue nonpareil for the eye and sprinkle a bit of yellow sugar on the body, staying away from the chick’s feet. Let the chicks cool and completely set up on your kitchen counter. It may help to let them sit in the refrigerator for awhile. Sift the powdered sugar into a small bowl and add the milk and corn syrup. Stir until well incorporated. Then color with orange icing coloring to your liking. If the icing is too stiff, add just a little more milk. If it’s too thin, add a bit of powdered sugar. 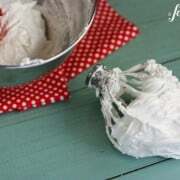 Pour colored glaze icing into a pastry bag fitted with a small round tip. Pipe on a little orange beak and a line across the chick’s feet. This glaze is easy to manipulate and “stretch”, using a toothpick, if needed. Let dry completely. Store in a single layer in an airtight container. The white chocolate will have a softer set than if using candy melts. Marshmallow recipe adapted from jam it, pickle it, cure it by Karen Solomon (I love, love, LOVE this book!). Glaze icing adapted from i am baker. I used this chick cookie cutter. Marshmallow Chicks concept from a farmgirl’s dabbles. If you liked these chicks, be sure to also check out my Chocolate Marshmallow Bunnies! A-dor-able!!! Love how these look & I’m sure they taste great, too! It was really, really fun to see them made by someone else! Thank YOU, you made my day!! Brenda, Your chicks look great but I LOVE marshmallow peeps! Maybe you need a lesson on how to eat them. I like to set them out for a day or two so that they get a nice hard crust on them. Then when you chew them they make extra noise like you’re chewing on a nice piece of styrofoam. You have to push them to one side of your mouth and chew them loudly with your mouth partly open. It also helps to squint your eyes or make a funny face while doing it. Always do this in front of an audience. 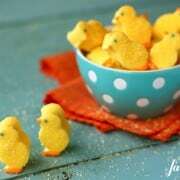 You should have an enhanced Peep eating experience if you follow my advice. Peeps DO NOT make good s’mores. Never, ever try this! The great thing is, I can hear your voice and see your facial expressions as I read this. You def got me to laugh out loud on this one! :) Hope you guys had a great Easter!! How can someone eat that – they are too cute! Hello Beautiful i’ve tried doing the marshmallow recipe, and i thought i got it…..but after leaving it to set and cool i noticed it started bleeding :S. yeah tiny drops i thought is was the syrup :S i dont know what i did wrong…. does it ever happened to you? i follow step by step the recipe. Let me know :( thank you! Hello Ariana! 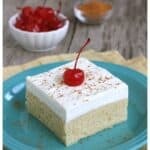 I have made this recipe MANY times and have never seen them sweat. All I can think is…do you live where it’s very humid? Well… kind off i mean is not coast but not a dry weather either… i was wondering…. even though i used the exact measure you put on the recipe, the syrup i used was very liquid, so probably that also helped the sweating . These are so stinkin cute!! Now I wish I had a tiny chick cutter! OMG!! 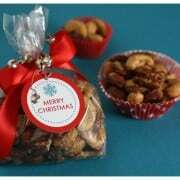 they are so nice and really look delicious!! Have you tried these with Banana Flavoring? The yellow just reminded me of bananas…but I do think I’ll try them at Easter. Love these. So cute. I’ve made your bunnies and LOVE them! These are gorgeous! I am a new follower for sure!!!! Love!!!! Your marshmallow chicks are really adorable. I love marshmallows especially at Easter. So cute! What a great idea – adorable marshmallow chicks! What a totally adorable idea! 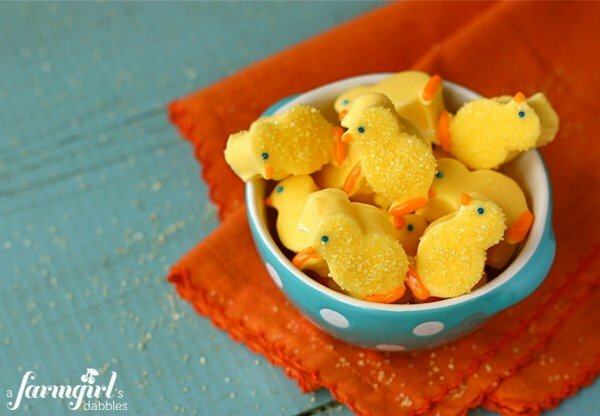 Personally, I really love peeps… but I’m sure these are much tastier. These are seriously amazing! I love it. I hope you will link up to my Hippity Hop Easter Project Hop. These are just beyond adorable Brenda!! OMG! This is too cute to eat! great job on these!!! so stinkin cute! I’m with you, the store bought peeps, blah, yuck! Homemade mashmallows are one of my top 5 all time favorite things to eat. A homemade peep coated in white chocolate and sprinkles, for reals, that’s fantastic! And yours are waaaaaay cuter! These look so professional. Love your sweet chicks. I just started a Spring contest, and you are welcome to link this post up for a chance to win some great prizes. WOW! Just found your blog through Tidy Mom and I’m loving it! I’m gonna hang out here and drool over all your yummy creations! I am so wanting to make homemade marshmallows, but I am so scared to. You make it look so easy! I’m going to pin this and save it for later! You’ve inspired me to try making my own! Thanks! So nice to meet you, Karyn – thanks for leaving a comment! I was once intimidated by marshmallows, too. But it’s so easy. Just make sure you have a reliable kitchen thermometer and a mixer! Thank you, Emily – nice to meet you! These are too adorable for words! Marshmallows can be a sticky mess, but cutting these cute chicks out was so worth it! I can see everything including your HAPPY FACE when you were small. Wonderful post. Thanks for sharing!!! i can’t take the cuteness!!! Your chicks are super cute! You can’t beat homemade! 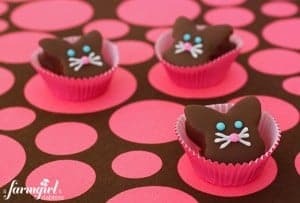 These are so very cute and I know that they are delicious. These are so cute! They remind me of the little bunny ones you had last year. I’m off to hobbycraft at the weekend so I’ll see if I can find a chick shaped cutter, this looks like the perfect way to spend the Easter band holidays. I think those bunnies are still my favorite marshmallow adventure…love the marshmallow dipped in chocolate! OMG these are the most adorable little chicks. I can’t wait to try these. They’re going to be so much fun to make. I’ll have to share them with the kids in the lane since mine are gone. Thanks, Vicki – have fun! Oh my goodness! How adorable! I’ll definitely have to do an upcoming feature on this! Oh I just LOVE these! I’d choose these over store bought any day~! I LOVE this! Posting it on my Facebook page. I never liked peeps and never bought them for my own kids. What do you do with the scraps of marshmallow when you have finished cutting out the chicks? We eat the scraps plain, dusted in powdered sugar to keep them from sticking together. Or dip them in leftover white chocolate. Doesn’t matter the shape, they’re still fabulous! Your chicks are “over the top” adorable! I’m smittten! I burned myself out on Peeps back when I was 9 – something about making myself sick on them. BUT – that has not deterred me from my absolute love of real marshmallows, particularly ones made at home!! And not to mention that these are just flippin’ adorable and covered in chocolate to boot! Precious, just precious. These are absolutely perfect. So adorable. Love them! You are adorable and so are these deliciously cute chicks. I do not like Peeps either. But, I cannot wait to make these! I cannot get over how adorable these are!! Way way better than the store bought kind. And I would know…I’m sort of an expert on them. I LOVE peeps. And now I need to attempt these, so many options for all the seasons with these. Hi Mellissa, nice to hear from you! These are a fun little project, let me know if you give it a try! Oh my goodness, these are the cutest marshmallows I’ve ever seen!! Love this! Wow, Brenda, I’m blown away!! So stinkin’ cute!! These are so cute. Do you think that honey can be substituted for corn Syrup? Hi Kristin! You made me curious about using honey instead. I found plenty of info telling not to substitute the corn syrup in marshmallow making. But I did find this one that looks promising: http://zscupoftea.com/2010/07/21/honey-sweetened-marshmallows-scd-gfcf/ – please let me know if you try it! My friend would love these! She always stashed away a few packages of peeps during Easter time, it was her guilty pleasure. So totally precious! I am compelled to Pin this!